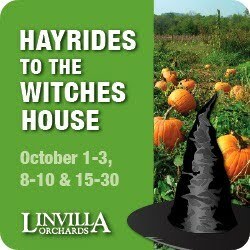 Hayride to the Witches House. bit of Linvilla’s apple cider only sweeten the deal. put you under a spell. When: October 1 thru 3, 8 thru 10, and 15 thru 30. Sponsored Post This post is sponsored by Just Between Friends of West Chester/Media Consignment Sale October 2nd and 3rd at Brandywine Youth Club 41 Thornton Road - Glen Mills PA.